An all-time low in sell-side sentiment towards the “post 2010” Lyondell, falling ethylene pricing in the US, and rising natural gas prices are signals to buy not signals to sell! Sell side sentiment for LYB has never been this negative – a time to buy based on our work. The stock has been discounting contracting margins for the best part of 18 months – the contraction is starting – time for the stock to begin discounting the bottom and a recovery. An Industrial and Materials capital spending pause – see accompanying note – could have a much more dramatic tightening impact on the ethylene market than on others, as the global ethylene market is more finely balanced than other commodities. Demand growth could accelerate in the US if a Trump tax cut and possible wage inflation drives consumer spending. Higher ethylene and polyethylene margins better played through LYB vs WLK and DOW. We estimate trough earnings for LYB of around $5.00 with Brent at $50 and US natural gas at $3.00 – see recent research. With gas moving higher more quickly than crude oil recently we would need to trim this estimate, but not by much. In the meantime the company continues to make much more than this because the European olefin business remains very profitable. Repatriation of offshore cash could result in a slightly higher share buyback in 2017, but if also combined with funds from a possible refinery sale, a lower US tax rate and on-going free cash flow, LYB could possibly buy back as much as 12-14% of the company in 2017. If the suggested slowdown in spending causes ethylene margins to recover more quickly in 2017 and 2018 than expected, LYB could maintain its buyback rate through 2018. At a more reasonable 9x EV/EBITDA and with a further 15% of the stock retired, LYB could see share price appreciation of more than 50% over the next 2 years. Simply using a crude oil/natural gas ratio LYB looks fairly valued today (Exhibit 2), but only if you assume that the incremental investor still expects a collapse in the ethylene/polyethylene margin such that the break-even point on the cost curve drives the market – something it has not done for the last two years (despite significant ethylene increases – see recent research). The stock is pricing in a trough in our view and moving with the variables of what might define the trough. 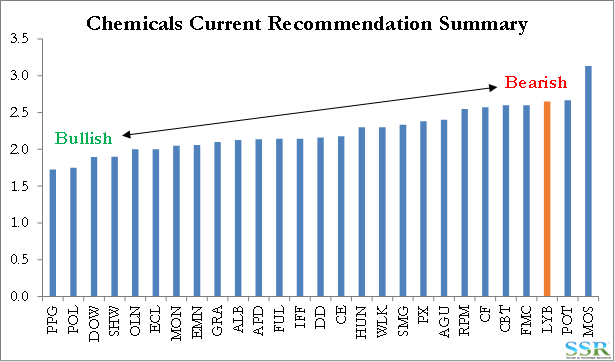 This suggests there is only real downside to the stock today if we see ethylene/polyethylene margins fall to the break-even AND we see the cost curve continue to flatten – i.e. US natural gas prices rise relative to crude oil. 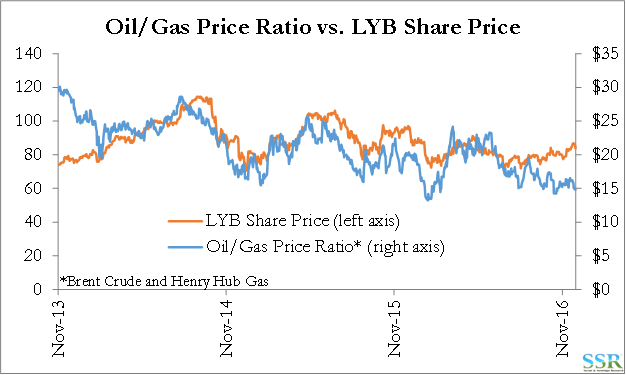 In Exhibit 2 we show the movements of the oil/gas ratio and LYB’s share price but Exhibit 3, which replaces share price with market cap, is probably more illustrative given the distorting effect of the very high share buyback. 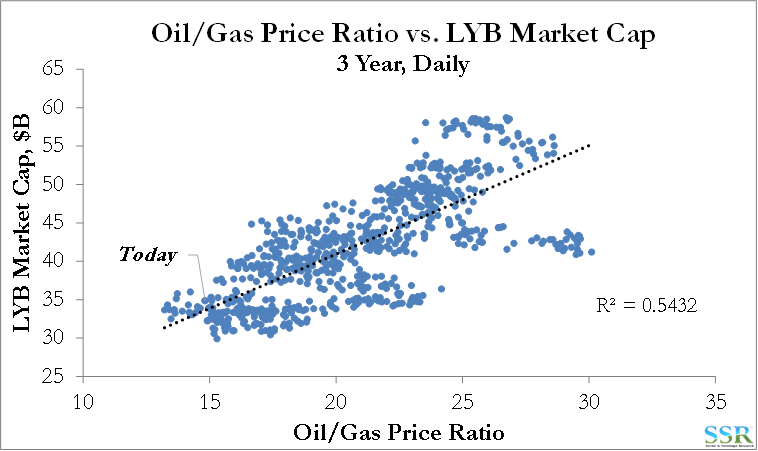 In Exhibit 4 we plot market cap against the oil/gas ratio, and while the correlation is not great the trend is clear. As we have written in recent research, we do not expect things to get as bad as the share price discounts – i.e. for the ethylene and polyethylene markets to fall to the theoretical break-even levels – because we expect demand growth to remain robust and we estimate that capacity additions, mainly in the US, will be more staggered and will not cause a significant overhang. We do however expect margins and profitability to weaken from the highs of 2016, and this is already taking place in Q4 2016. LYB estimates for 2017 are still in our view too high, but $7.50 per share is more likely than the $5.00 per share that the stock appears to be discounting today. 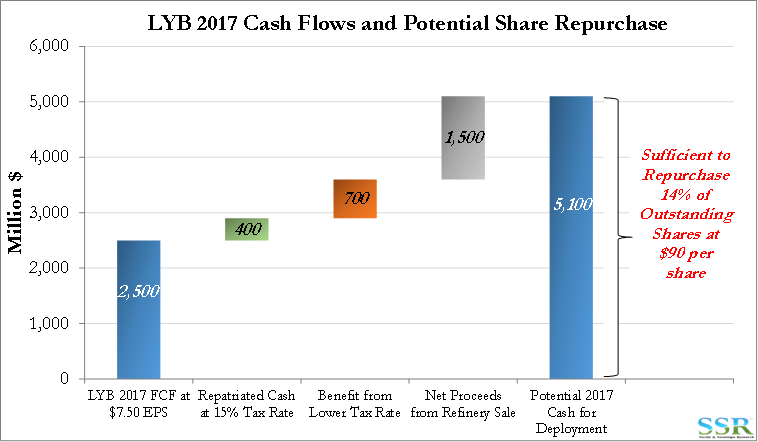 Furthermore, we estimate that LYB should remain a large buyer of its own shares in 2017, with cash coming from multiple sources, including the repatriation of offshore cash and the sale of the refinery. We can also make a case for a tighter ethylene market and a larger super cycle post 2018 than we thought previously, with a possible capital spending slowdown across all industries – driven by uncertainty in the US and Europe (see accompanying research) – impacting the ethylene market more acutely than others. If this is combined with strong consumer spending – especially in the US, driven in part by lower taxes, in part by higher employment and in part by wage inflation – ethylene could get very tight very quickly. Lower capital spending would positively impact other commodities – but unlike ethylene, there is a large global commodity overhang for most and rising prices will quickly draw out more product. LYB had $2 billion of EBITDA in Q2 2015 and if we use that as a conservative “peak 2019” and apply an 8x multiple we generate a $64 billion EV. With net debt of $8 billion and as few as 320 shares by end 2019, we derive a share price of $175. We recently published a piece looking at consensus recommendation extremes as a signal to do completely the opposite of what is recommended. Not only is Lyondell one of the least loved stocks in the group right now – Exhibit 5 – but it is also at an historic extreme, albeit based on a short history – Exhibit 6. 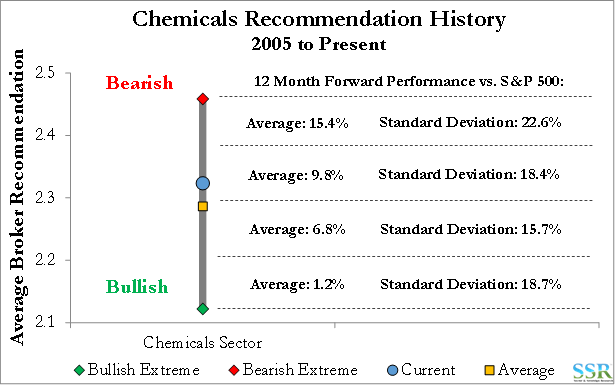 In Exhibit 7 we repeat the summary chart that we included in the piece we published on sentiment, as expressed through sell-side consensus, and performance for the chemicals sector. 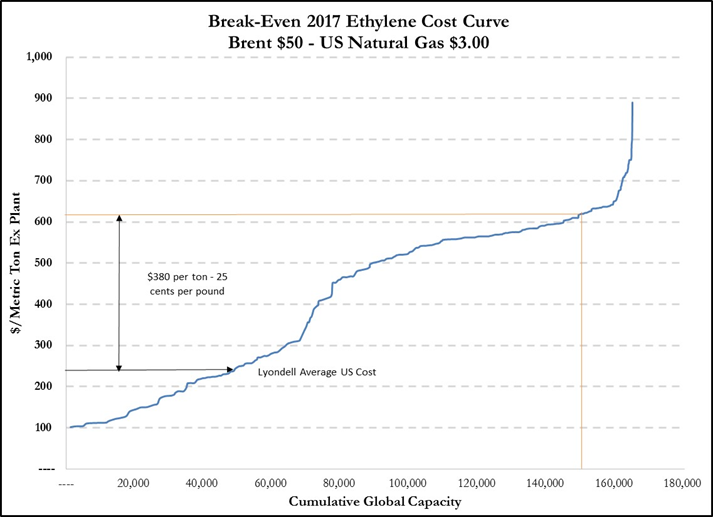 In Exhibit 8 we repeat a chart from our earlier piece on Lyondell, modeling the global ethylene cost curve at the plant level under the assumptions of crude at $50 a barrel and natural gas at $3.00 per MMBtu. 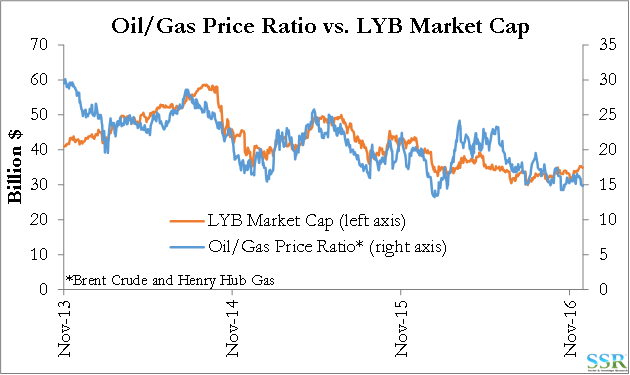 LYB’s margin umbrella is substantial and we would need to see meaningful contraction in the oil/gas ratio for the company to lose its edge. In Exhibit 9 we show a couple of exhibits for those more interested in short-term movements in the stock. 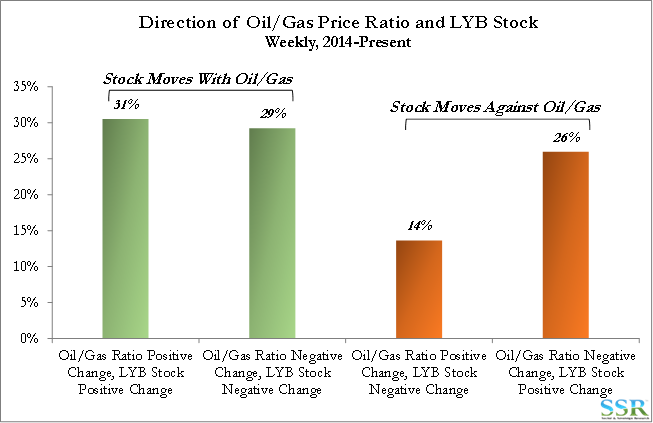 Relative movements in oil and natural gas prices have been predictive of movements in LYB share price about 60% of the time since 2014. 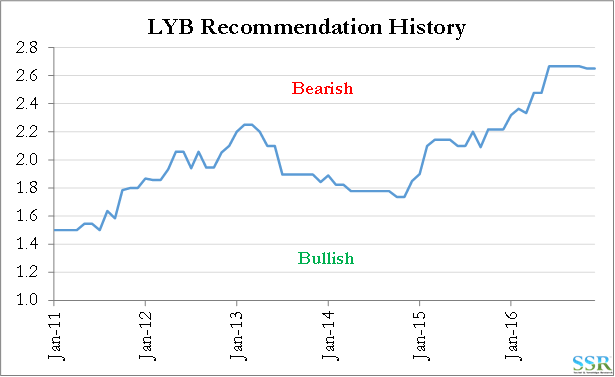 While we expect LYB earnings to fall short of current consensus expectations in 2017, we do not expect a precipitous decline and we do not believe that earnings will fall to a level that is implied in the current price. In the analysis in Exhibit 10 we assume that earnings in 2017 fall to $7.50 per share ($2.00 lower than current consensus) – generating free cash flow for buybacks that is around $800-850 million below consensus. However, if we assume that the company can sell its refinery and we add a bit of Trump repatriation and lower tax rate magic, we can find as much as $5 billion of cash to be devoted to share buy-back. The assumption we make in the overview – that LYB can have as few as 320 million shares by the end of 2019 –does not look like a stretch if the company can buy back 50-55 million shares in 2017 alone.